Lucy Bee Himalayan Salt is 100% natural and unrefined and contains numerous trace minerals. These rose-coloured salts hail from the foothills of the Himalayas and are renowned for being pure, since they’re untouched by toxins and nasties that can often be found in other salts. Himalayan salt is rich in trace minerals, electrolytes and elements. The salt can be added to a hot bath for a relaxing soak or as a homemade body scrub to exfoliate the skin. Can also be used for cooking. 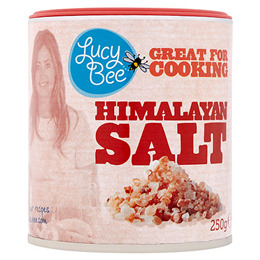 Below are reviews of Lucy Bee Himalayan Coarse Salt - 250g by bodykind customers. If you have tried this product we'd love to hear what you think so please leave a review. Lucy Bee Himalayan Salt is 100% natural and unrefined and contains numerous trace minerals.